Seanbaby's Hostess Page - Wonder Woman in "Dilemma"
If you've seen "Trainspotting" you'll know that in Edinburgh, we spend a lot of time hanging out in dangerous areas looking for discarded hypodermic needles and aerosol cans. And it takes more than the sound of falling boulders or an oncoming train to distract us from our toil. Nothing less than an Amazon princess waving cake could lure you away. Lucky for these little rascals!! But one of the kids wasn't quick enough. You can't see him because he's under the train, saying "Golly, do I like twinkies!" in the penultimate panel. "If my arms hadn't been severed at the shoulders, I could be enjoying the moist sponge cake right now!" So WW brings the speeding train to a complete halt right before it gets to the landslide. If WW is actually running fast in the first panel and not just showing off, that's at least 100mph to 0mph in a couple of seconds. Can you hear the heads squishing? 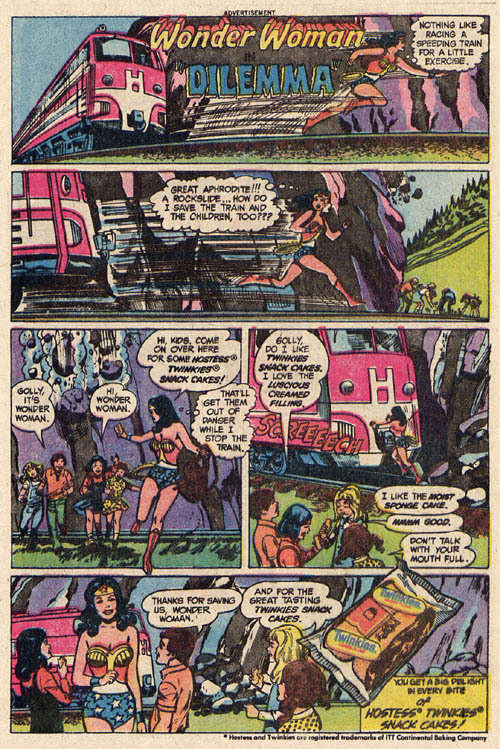 Depending on the actual speed of the train, WW has just killed/maimed/coffee-scalded the crotches of all the passengers, to save the lives of a group of uptight junkie seven year olds - "Don't talk with your mouthful!" This coming from a kid who decided to play on railway lines, near an avalanche. "Thanks for saving us, Wonder Woman. Hey - she's grabbing Mr Happy!" But it's OK, she slips him $5 afterwards and he scores enough crack to see him through until the next day, when he and his pals will be rollerblading around the mouth of a shark infested volcano collecting cigarette butts with Jim of John Elway's Quarterback fame.